The book has a whirlwind of events and emotions that would have easily touched and captured one's heart but unfortunately, it wasn't able to have mine. Although, I like how it addresses some issues in our reality that occurs to teens (e.g. drugs, crime, emotional trauma, etc. ), it hadn't given me the satisfaction or it didn't put me on the edge as a reader. To elaborate, Cassie was a character I wasn't able to connect with or liked even. It's not about her experiences because I am not that cold. I even want to sympathize but it was how she address her issues. I know she's a teenager and had been through a lot but she whines about it and treat everyone as if they were to blame. I know that she cannot accept it all at and forgive herself from everything she did in an instant because what had happened to her was such a heavy burden to carry on, and she only has a brother to make it all feel light and better. I also know that I cannot compare my experiences to hers but clearly her personality was not that strong to be able to succumb to all her fears and weaknesses. For all that has been said, she could have been an inspiration to those in a similar situation as her, and also to us readers, but her character failed on that. I also do not like the swearing. Maybe Cassie needed it to express herself but it was annoying that all I can read was f this and f that. Even the chapters were full of that word which I think was trying to hard and somehow distracting. I already get she is a messed up kid. I do not need a constant reminder. 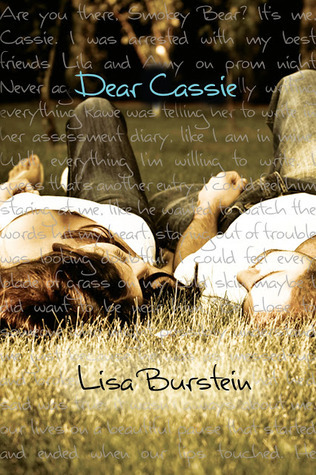 In short, Cassie was a damsel-in-distress who loves to swear and whine. Period. Another is that I think the story focused more on romance a bit too much that somehow contradicts the process and her purpose of being there in camp. Don't get me wrong, I am a hopeless romantic and it thrills me to read love stories but it was taken out of context. It missed the whole point of the story and the morals it could have told. It could have dealt with self-discovery/self-improvement, forgiveness of others and self, acceptance, changes, friendship and trust but instead the plot and the protagonist relied too much on the budding romance. Despite all these, I would praise another character whom I think is a greater inspiration than Cassie could have been: Troyer. Laura Troyer was able to instill the motivation and inspiration I am looking for. She was literally a very silent character and someone you would have ignored and thought irrelevant since you cannot even feel her presence but that was not the case. She has depth the other characters does not have. She was able to face her problems and definitely solved them on her own without a single whine coming from her mouth. I think she was a pretty good character that shines over everyone including the protagonist. Bottomline: the characters did not mature except for Laura Troyer. There were actually some characters who started great and strong but somehow lost their way and became immature like the rest of them. Overall, the story have so much promise and even started intriguing but it ended flat and somehow shallow. The main purpose, the supposed lessons learned, and the realizations were forgotten towards the disappointing ending when the heart and impulse made the decisions that it felt like a cycle of drama. Here's the trailer of the book, enjoy!